Considering that you spend about one-third of your life in bed, choosing the right mattress is incredibly important. More than ever, however, the market is flooded with competing options, which makes it tricky to pinpoint suitable options. Arm yourself with the information that you need to be a savvy mattress shopper by familiarizing yourself with some mattress buying basics. By the end of this guide, you'll know how to find the mattress that's right for you. In terms of mattress construction, there have been significant improvements over the last ten years. As long as you don't go into the low end of the market, durability should not be significantly different among brands and models. Major attributes to consider are firmness, and construction. Firmness - test out the mattress to make sure it feels comfortable. Also make sure that the firmness is consistent across all areas of the mattress. Construction - learn about how the mattress is made. More expensive mattresses typically have damask ticking, thicker padding, higher coil counts, and a cushion sewn into the mattress. Coil count and configuration seem to have little effect on durability. Sagging in mattresses is caused by the padding, not the coils. Therefore, when comparing mattresses look at for thicker, higher quality padding. In years past, innerspring mattresses were pretty much the only game in town. To this day, many folks equate the number of coils in a mattress with its overall quality, but coil count simply isn't an accurate or reliable way of assessing the comfort or support that a mattress provides. Specialty foam mattresses rose to prominence within the last 15 years, and many people consider them to be superior to innerspring models in every way. That's not true, either. In reality, innerspring models work perfectly for some people while specialty foam models work better for others. Innerspring Mattresses - The typical innerspring mattress consists of springs, or coils, that are overlaid with fibers, foam and other materials. Coils in the cheapest models are bundled together rather than individually wrapped. The latter is preferable as it provides more support, delivers better pressure relief, transfers less motion and contours better to the body. As mentioned previously, coil count isn't that important. What matters is the design of the coils themselves and their gauge, or thickness. A coil gauge of 12 reflects a thick, firm coil that's best suited for heavier folks while a coil gauge of 18 reflects a thin, "bendier" coil that's better for smaller folks. Specialty Foam Mattresses - Memory foam and latex foam dominate this category. The former is a slow-response type of foam that puts no additional pressure on the body. It's typically tempered with gel to ward off the overheating that is associated with cheaper types of memory foam. Latex foam tends to be more durable and more supportive, and it has a more neutral temperature. Price - When it comes to mattresses, pricier doesn't necessarily mean better. In fact, Consumer Reports famously noted that a $540 mattress delivered remarkably similar quality as a $5,000 model, with materials quality largely dictating the huge price disparity. Indeed, they also noted that it's perfectly possible to find a terrific mattress for as little as $600. Size - Finding the right mattress is easier when you know which size works best for you. If you are a couple, a queen- or king-sized mattress is probably ideal. The former measures 60" x 80" while the latter measures 76" x 80". 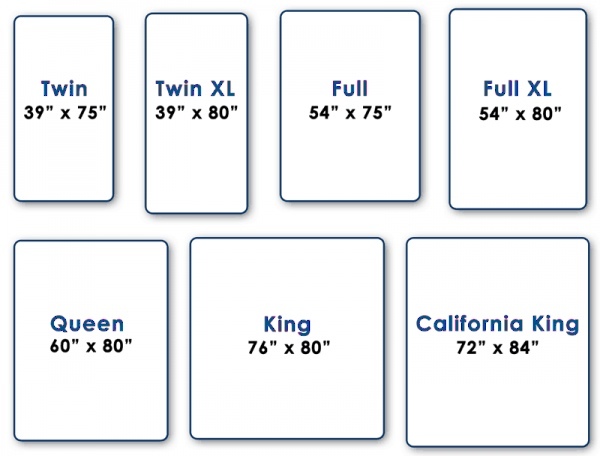 California kings measure 72" x 84", full or double mattresses measure 53" x 75" and twin mattresses measure 38" x 75". Support - The right mattress will easily counteract your weight to keep your body in the proper alignment while you sleep. Firmer isn't necessarily the answer because bodies are not straight lines, and mattresses must have enough "give" to accommodate contours and curves. Comfort - When we talk about comfort and mattresses, we're really talking about pressure relief. No area or part of your body should be subjected to excessive pressure while you sleep. Otherwise, you will wake up frequently and be unable to maintain REM sleep, which can leave you feeling exhausted despite supposedly sleeping all night. Motion Separation - This applies only if you will be sharing the mattress with someone. Ideally, your partner should not be disturbed when you move around on your side of the bed. Well-designed mattresses largely eliminate this problem. Individually wrapped coils help a lot, and memory foam tends to outperform latex foam in this regard. Edge Support - You won't sleep very well if you feel like you're in danger of plummeting off of the side of the bed during the night. Even if you're near the edge of the bed, you should feel secure. This isn't an issue with specialty foam models, but innerspring models employ an upgraded foam encasement around the edges to prevent this problem. Steer clear of models that use steel rods around the edges. Temperature Regulation - The best mattresses are temperature neutral, which means that they don't heat up when in contact with a body. Poorly designed, cheap memory foam tends to have this issue, but some innerspring models can too. Many mattresses keep this issue at bay through the use of special foams, ventilation, phase-change materials and other features. Appearance - Look at the color, fabric, and stick pattern to assess quality. However, remember that the mattress will be covered with sheets 99.9% of the time. Manufacturers often tout specialized features to try and get consumers to part with more money. All too often, these features just aren't worth it. For example, some mattresses have so-called lumbar support zones. If you have back problems, you may be tempted to buy one. Be warned, however, that it's really hit or miss as to whether or not this feature will give you any relief. Pillow tops on mattresses are claimed to deliver extra comfort, but that's typically only true for larger people who sink down far enough to justify the extra padding. Also, don't assume that you have to buy a box spring for your mattress. If you have an existing one that is the same size, it should suffice. Remember, though, that you may be required to buy the matching box spring to enjoy full warranty coverage. Ticking - The mattress' outermost layer. Most are made of a cotton-polyester blend, polyester, or vinyl. Vinyl is used on the cheaper mattresses. Quilting and top padding - Most mattresses have a few layers of padding attached to the ticking. These are generally made of foam. Middle padding - Often starts with "egg-carton" foam. May also include thick wads of cotton called garnetted cotton. Insulated padding - Lies directly on top of the springs to prevent them from being felt. Common materials include: matted fabric, plastic fibers, and coco padding (fibers from coconut husks). Handles - Most include handles for use when positioning the mattress. They are not meant for carrying the full weight. Box Spring (foundation) - Provides extra softness and comfort. It can be simply a wooden frame covered with boards, a wooden frame with springs, or a metal frame with springs. The industry has really cleaned itself up over the last 10 years. Here are a few of the questionable sales techniques that were more commonly used in the past. Keep your eye out for these, and if you feel uncomfortable, find another retailer. Bait and switch advertisement - some stores use ads for cheap mattresses to get you to the store. Once in, you'll be led to a costlier model. Questionable pricing - Stores list prices that nobody ever pays, discount prices that are open for further discounting with negotiation. Fine print - Some stores have additional charges that you don't find out about until something goes wrong. Late deliveries - Many promise to deliver within 24 hours, often it takes two to three weeks in reality. Confusing jargon - Each company has its own set of terms for mattress quality and construction techniques, making it difficult for consumers to comparison shop. Comparables - The names of almost identical mattresses ("comparables") often differ from one store to the next. This is another way comparison shopping is discouraged. Online - You can buy just about anything online, and mattresses are no exception. Buying a mattress online is nice because you can do all of your research from the comfort of home and can easily comparison shop. The biggest downside, of course, is that you can't actually try the mattress before you buy it. Therefore, only buy a mattress online if you're either able to try the same one locally, or if the online retailer has a fair and generous return or exchange policy. Big-Box Stores - Stores like Costco and Sam's Club have veritable steals on many high-quality, name-brand mattresses. Like buying online, though, you can't often try all of the models that they offer in-store. Fortunately, Costco, in particular, has an extremely generous return policy. Department Stores - Large department stores typically have large selections of mattresses, so you can try many in a single visit. They'll usually also match competitors' prices. Mattress Stores - Dedicated mattress stores are nice because the staff really know their stuff, and they almost always have price-matching policies. However, many are small, mom-and-pop operations, so buying from them can be a little risky. A mattress isn't the kind of thing that you just swing into a store to purchase. Instead, you should take your time, do your homework and avail yourself of as many resources as possible to find a suitable option. By keeping the points in this guide in mind, you'll zero in on the ideal mattress in no time. Be sure to check with the local BBB for complaints before buying. For comparisons on how different models compare, see consumer reports.